Holiday Inn Leeds-Wakefield01924 230600work HotelThe Holiday Inn Leeds Wakefield enjoys an excellent location 9 miles south of Leeds City Centre. It is situated off Junction 40, M1 and only 2 Junctions away from M62 Motorway. With complimentary* car parking for up to 180 cars our versatile packages have something for everyone. The Holiday Inn Leeds Wakefield is part of the world’s most recognised hotel brand and prides itself on bringing you that personal touch. Whatever your requirements the hotel offer a variety of facilities such as 104 bedrooms including 12 executive bedrooms with high speed internet & air conditioning, Traders Bar & restaurant, 8 conference and function suites all with natural daylight & air conditioning and accommodating up to 160 guests. All rooms were refurbished in 2015 including new bathrooms. All rooms have air conditioning & Flat Screen TV's. Holiday Inn Leeds Wakefield provides an ideal base for visiting popular local attractions including the National Coal Mining Museum for England, The Hepworth Wakefield, Xscape, Yorkshire Sculpture Park and Diggerland. 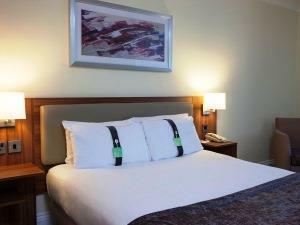 The Holiday Inn Leeds Wakefield enjoys an excellent location 9 miles south of Leeds City Centre. It is situated off Junction 40, M1 and only 2 Junctions away from M62 Motorway. With complimentary* car parking for up to 180 cars our versatile packages have something for everyone. *Please note the hotel car park is monitored by a third party, all cars at the hotel must be registered at reception to qualify for free parking. Please note smoking is not permitted in any part of the hotel. The hotel enjoys a partnership with Total Fitness Leisure Club which is located adjacent to hotel, please enquire at reception to take advantage of the special rates available. The Holiday Inn Leeds Wakefield welcomes Children so take advantage of our Kids stay and eat free program (Terms and conditions apply) Children welcome from any age.